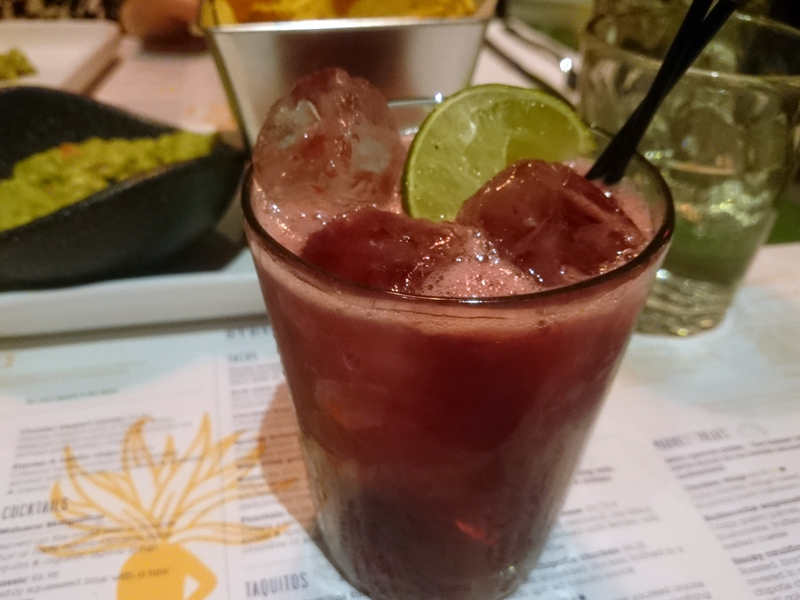 Wahaca has been the long awaited opening that has got Brighton a bit excited. Thomasina Miers, who won Masterchef back in 2005, has built her empire of restaurants on her love of Mexican food and travel. It's a substantial chain that has seen one of the biggest successes from the show's winners. The atmosphere here is fun, bright and lively. A mash up of graphic prints (back pat for the genius who found velour dogtooth bucket seats - you hero), neon, illustrations and type. Overall it does smack of chain restaurant as it's so slick and formulaic, but it has been very well done and a gold star for the bathroom too. A nice touch is that each of their locations features bespoke art from different creatives and in Brighton these are from Mexican street artist Mazatl. Hey, anyone that invests in creatives gets my vote. Drinks are great. The large bar area is prime for those dropping in for booze, nibbles and a game of foosball. I enjoyed my pretty hibiscus Margarita and gin and tonic from the lengthy cocktail list. There's also fresh pressed juices, Mexican beer and quite extensive tequila menu with a selection of all three types; Blanco, Reposado and Añejo. They are all 100% blue agave too unlike inferior brands that can contain just 50%. I wouldn't mind going back for the tequila flight to learn a little more even though I did go on a tequila bender with Clio Roccas* once, who is now a Tequileira, so have already been sold to the cause. This time though we opted for a sip of a super smooth and smoky Mezcal which you have to try. 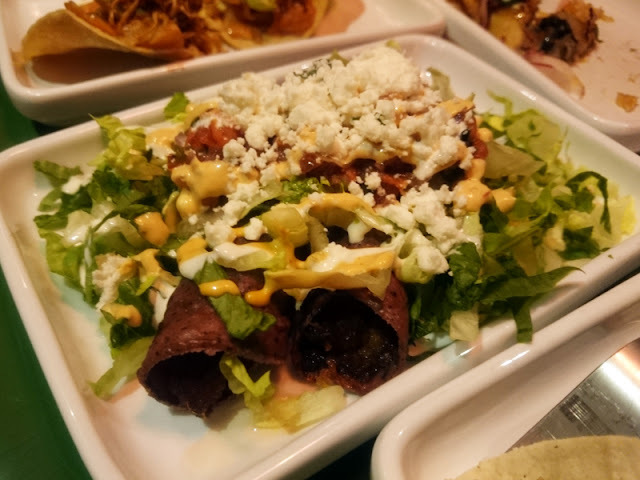 The menu contains the tacos, tostadas, enchiladas and quesadillas you'd expect with both classic and modern interpretations. When I think of Mexican food I think of vibrant flavours, contrasting textures, acidity, heat... on the whole though the food was lacking those highlights and that punch. 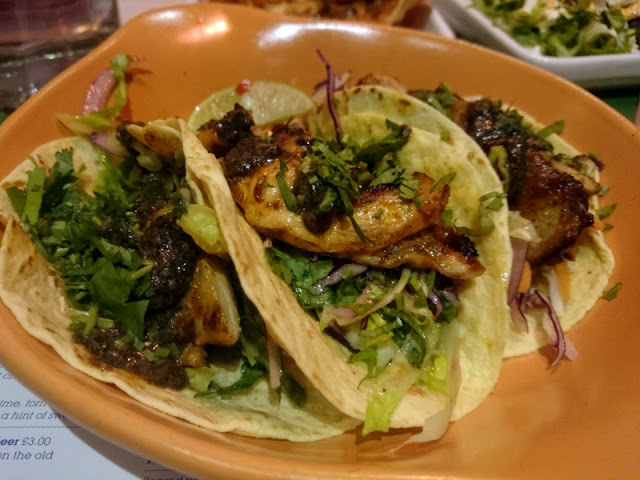 Most successful was the Pasilla chicken tacos that had good smoke from the chargrill and a decent level of heat in the (intentionally!) burnt habanero salsa. With a soft tortilla I like some crunch from a salad or radish which this had too. The steak in the tacos was beautifully tender. The rest of the elements were simple but as the steak was so good, I didn't mind. Empanadas I adore. These were stuffed with an earthy mushroom and sweetcorn filling. The pastry could have been crisper, but were enjoyable none the less. 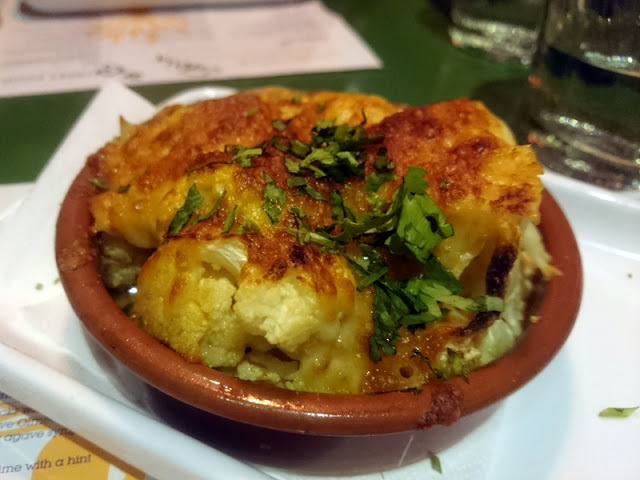 Is cauliflower cheese a Mexican dish? No idea, but this was a pleasant side dish. Not much heat or the promised smoke, but fine. It's cauliflower cheese. 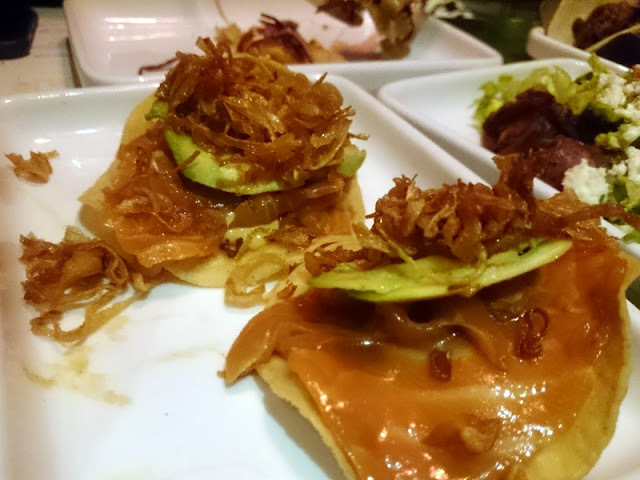 I was looking particularly forward to the raw salmon tostadas which looked the part but the lime and tamari were a no-show. The textures were all quite similar really and a bit slimy by nature. Again the sweet potato and feta Taquitos were not crispy and there were no discernible flavours coming through, maybe having too many elements so they became muddied. Service was as enthusiastic as an X Factor first audition. I was taken aback at first but really warmed to the bounding friendliness. Although I normally prefer things a little more low-key, it suits the fun style of the restaurant and the atmosphere. All the staff seemed really upbeat and welcoming and if they keep it up could be a real USP of this place. Churros for dessert are a given. These were light and crisp. With chocolate and caramel sauce, I can't see who couldn't enjoy these. I don't get the spoons though. Horrible to eat with and to hold. If I'm out at a restaurant, the last thing I want to eat with is oversized toddler cutlery. The only thing this could be is a marketing hook (something about a spoon amnesty) but instead of stealing these for a free taco, next time I'll be bringing my own dessert cutlery from home. It's hard not to be overly critical of the London chains that are moving into Brighton. Many are fiercely anticipated and coming from the big smoke, you naturally put them on a pedestal. The super-hyped Polpo has so far been disappointing to many people I speak to, and I know I'm not the only one praying that Franco Manca (opening soon) remains true to their original quality and craft despite the big buy-out and expansion. 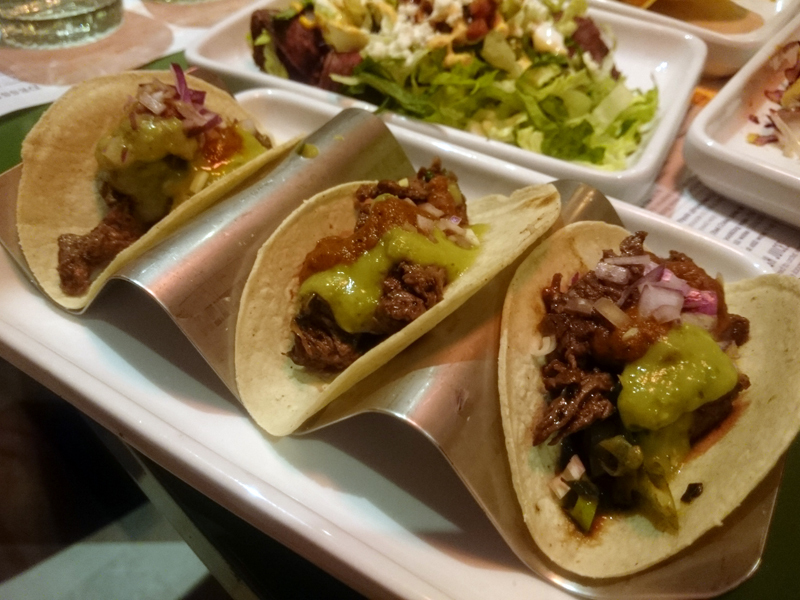 MeatLiquor brought something quite new to the city and continues to thrive and I think Wahaca should also do really well here, the relaxed, fun and inexpensive nature suits the city and and we lack many large venue options. 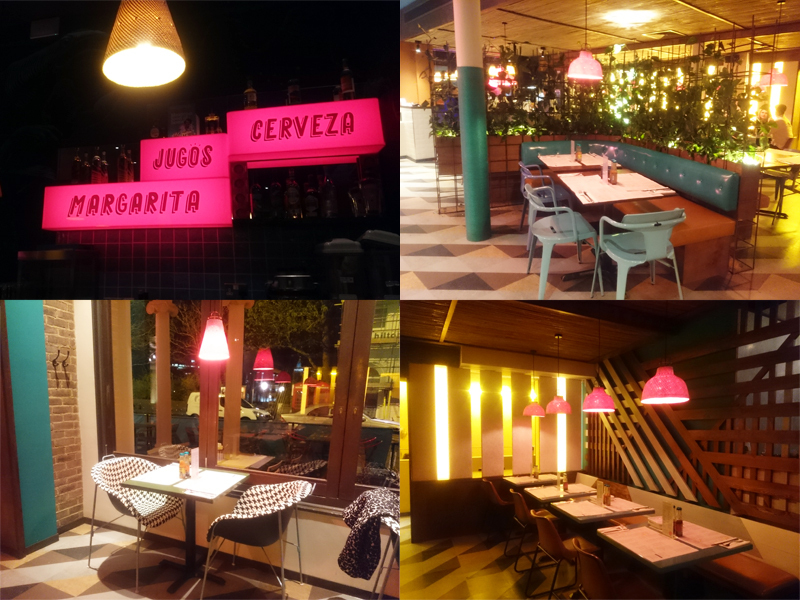 I did enjoy my visit here, although I'd expected the food to be a little better, I'd certainly come back to make a bigger dent in the tequila menu and try some of the larger dishes. 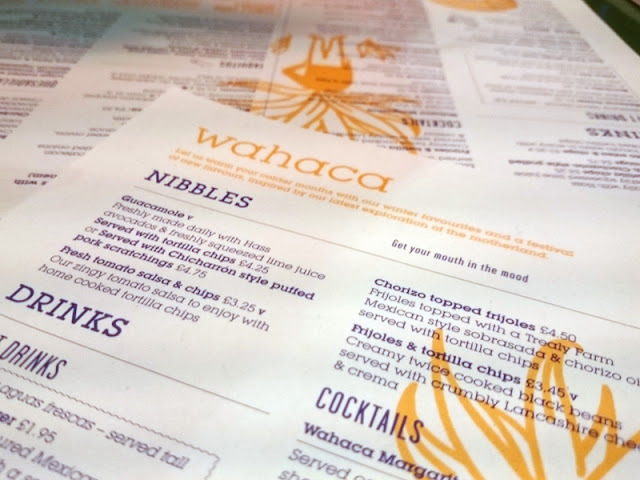 I dined as a guest of Wahaca. *This is my only shameless celebrity namedrop, I promise.